Recently, we set out on an epic 12-day campervan road trip through some of the most beautiful regions in Scotland. 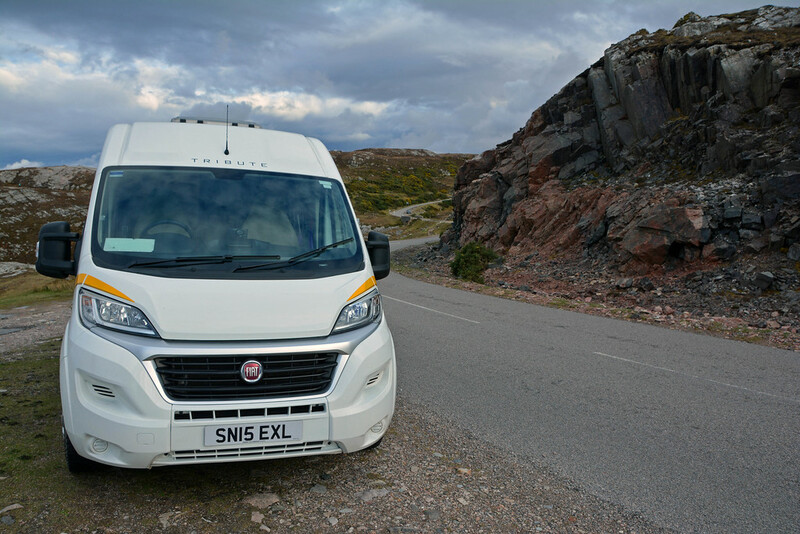 With our Aero model campervan from Bunk Campers, we drove the award-winning North Coast 500 route, visited the Isle of Skye, and explored Cairngorms National Park. Prior to this adventure, we hadn’t heard much about wild camping, as it isn’t common practice in the States. Our travel style is very much about escaping the crowds and connecting with nature, so the idea of having the freedom to park (almost) anywhere we wanted for the night was definitely appealing to us! Want to know more about wild camping in Scotland?! 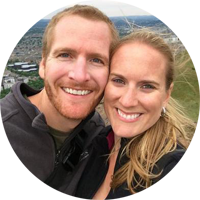 We’re excited to share our experiences with you! Now, I know what you’re thinking… what about the practicalities of wild camping with a campervan? Can I really park anywhere? How will I prepare my meals? Will the heater (or air conditioner) work? 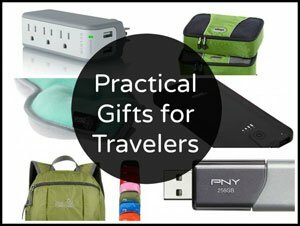 How will I charge my cell phone and camera batteries? Will I be able to take a shower and use the toilet? These were the questions we had about wild camping before we set out, so we’ll be sure to answer all of these and more as we tell you about our experiences wild camping in Scotland. But before we get started with our experiences, let’s talk about the definition and legalities of this popular Scottish leisure activity. 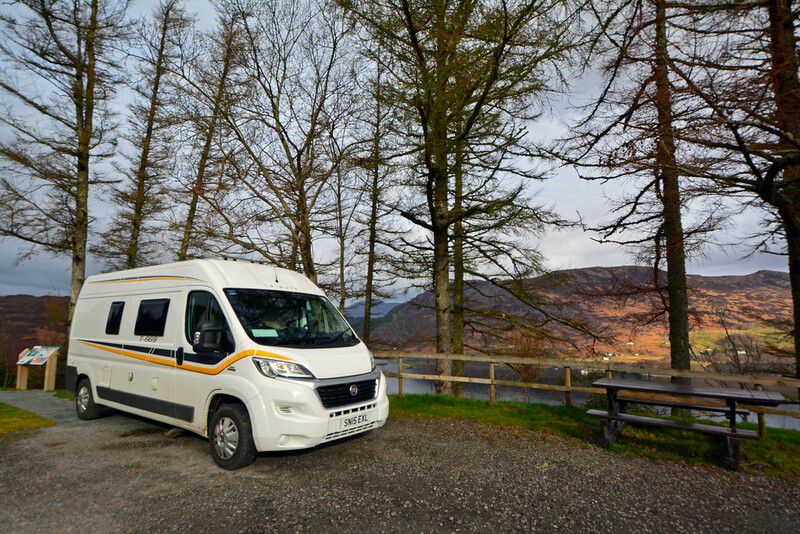 EDIT: We’ve received both negative and politely informative comments on this post regarding our definition and promotion of campervan/motorhome wild camping in Scotland. We have added an addendum to the end of this post to address these comments, so please read through to the end! Wild camping (also known as free camping) basically means setting up camp away from an organized campsite. This could be in a tent or campervan/motorhome, but for the sake of this post we’ll be writing about free camping in a campervan, because that was our experience. 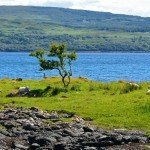 For the most part wild camping is completely legal in Scotland. Unless you see a ‘No Overnight Camping‘ sign posted, chances are you are probably safe to park your campervan for the evening. This isn’t necessarily the case in other parts of the UK and Ireland, however, so do your research if you’re hoping to do some wild camping with Bunk Campers in those countries. 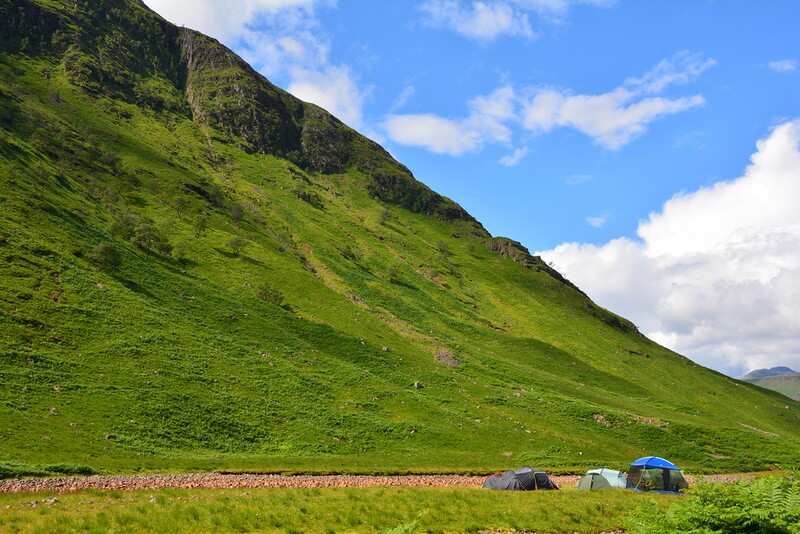 Although wild camping is legal throughout most of Scotland, there are a few things to ‘know before you go’! Use common sense, park a good distance from any roads, and respect the area you choose to park. Ok, so obviously this won’t be an exhaustive list, as we haven’t been everywhere in Scotland, but we can tell you where we wild camped and places we recommend. The first few days of our journey were along the North Coast 500 route, which runs along the northwestern tip of Scotland. Since we were still getting to know the ins and outs of the campervan, we stayed at campsites for the first 5 nights. On the 6th night of our journey, we decided to try wild camping for the first time and parked alongside Loch Carron in Stromeferry (pictured below). The biggest challenge in finding a place to wild camp in a campervan is finding level ground! We pulled into a few other potential spots before deciding on this one, simply because the ground was too uneven everywhere else we tried. It completely worked out in our favor, because it was an amazing first night of wild camping, though you’ll have to keep reading to find out why! We found the campsite prices in Cairngorms National Park to be a bit high when compared to the rest of the country. That being said, there is no entrance fee to get into the park, so that can justify the premium a bit! 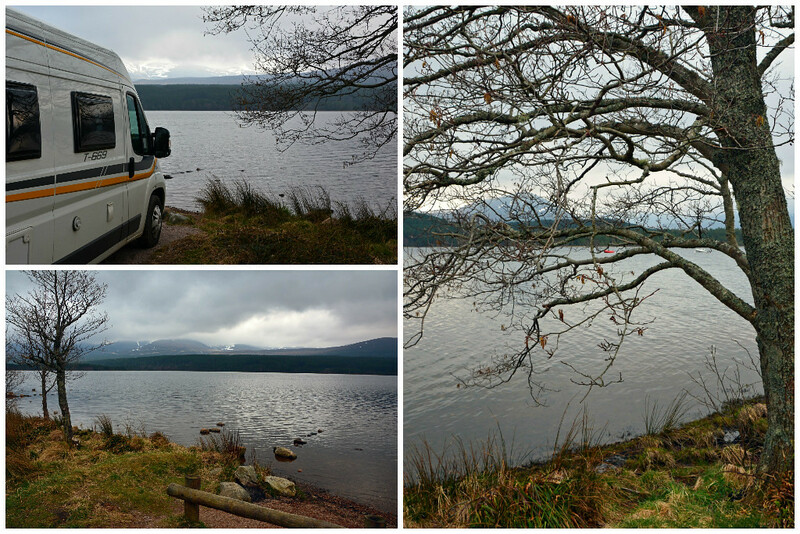 For our first night in the park, we found a spot right along Loch Morlich. We fed £2 into the parking machine (£2 covers all-day parking) and situated ourselves facing the loch and surrounding snow-capped mountains. Two other campervans/motorhomes were parked in the same area, but nowhere near our vehicle. This parking area sits right off a road, but there was hardly any traffic in the evening. Technically, our all-day parking privileges ran out at midnight, though we were prepared to put another £2 into the meter if need be. No one seemed to mind and we left before 8 am. 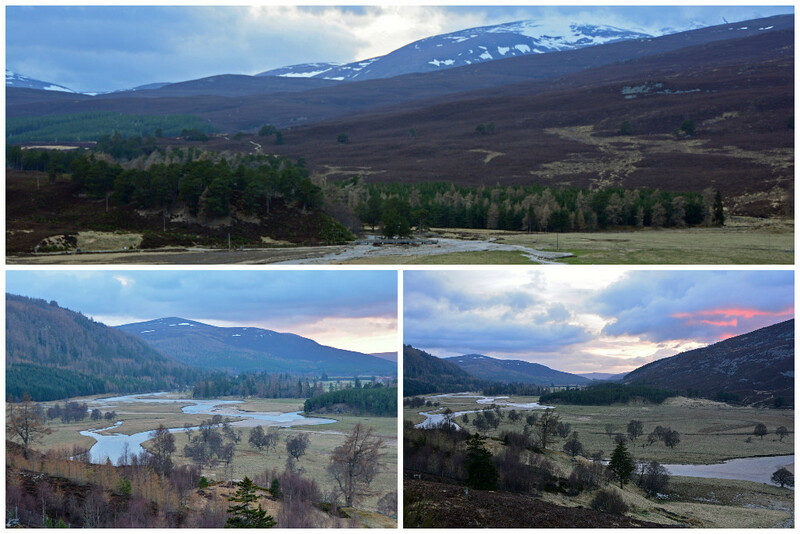 For our second evening in Cairngorms, we secured an awesome parking spot overlooking the River Dee on the east side of the park. The sun was just about to set behind the mountains when we arrived, so our timing was perfect! Again, we departed early in the morning and left no evidence of our stay behind. 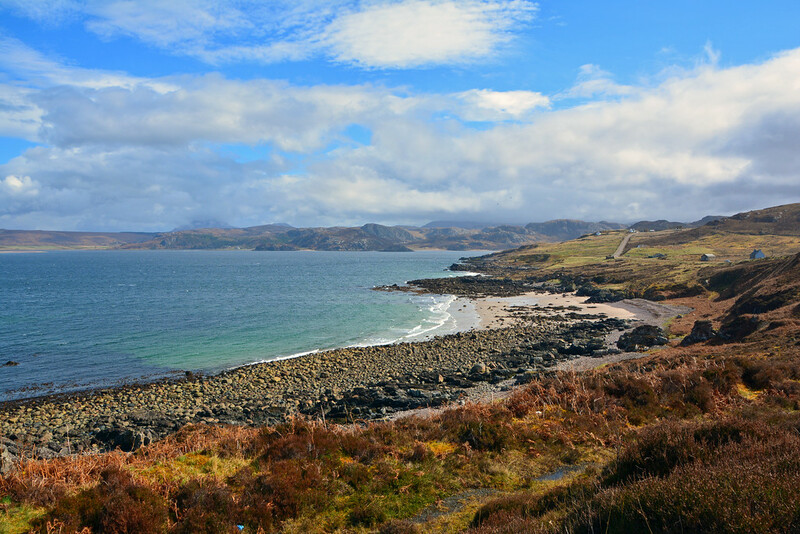 Isle of Skye offers some of Scotland’s most scenic landscapes! Following our brief visit, we now know why everyone raves about it- it’s absolutely stunning. If we had to pick a favorite view from our wild camping adventures, it would definitely be Neist Point on Isle of Skye. We arrived in the afternoon to one of the most incredible landscapes we’d ever laid eyes on and within seconds decided that it would be where we would camp for the night. We couldn’t believe there weren’t any ‘No Overnight Parking‘ signs posted, and later that night, we couldn’t believe that there was only one other family wild camping nearby. Hmmm, on second thought, maybe we should keep this epic wild camping spot to ourselves! COST – Of the 12 nights we spent in our campervan, we wild camped for 5 nights. Of the evenings we paid for a campsite, we came upon one that cost only £12 (~$21.50 USD), whereas all the rest were £19-22 (~$27.50-$31.50 USD) for a pitch with hook-ups. Keep in mind, the price will vary by location and season, and not all campgrounds are open year-round. There were several campgrounds around Cairngorms National Park that were upwards of £26 ($37.50 USD) per night, which seemed a little excessive. So, for the sake of simplicity, let’s say we would’ve paid £20/night for the 5 nights we chose to wild camp… we just saved £100 ($144 USD) AND got to experience two of our favorite benefits to wild camping- solitude and incredible views. NO SET SCHEDULE – Because it rained A LOT on one particular day of our drive along the North Coast 500, we didn’t make it as far as we had hoped. Not having a pre-paid reservation at a campsite allowed us to stop for the night earlier than we had planned, so the next day we could continue along our route with better visibility. That’s a definite perk to wild camping – you can change or adjust your plans, as needed, because you’re not committed to a set schedule. SOLITUDE – I think more than saving money, the majority of wild campers choose to do so for the freedom and solitude that comes with parking (or pitching their tent) away from others in the great outdoors! At a campsite, you may have a few yards between you and the next set of campers, whereas with wild camping, your closest neighbor could be miles away! It’s just you and nature and whatever peaceful sounds may come with it- ocean waves crashing against the base of a cliff, lake water lapping gently along the shoreline, sheep bleating or cows mooing in nearby fields, birds chirping in the trees, or simply the sound of silence! Gruinard Bay – We only stopped for lunch, but would totally wild camp here! INCREDIBLE VIEWS – I think for us, our favorite benefit of wild camping was the incredible views we came upon during our stays, including Loch Morlich and the River Dee in Cairngorms National Park, along with our personal favorite- Neist Point on the Isle of Skye. An experience that we won’t soon forget is seeing the Northern Lights over Loch Carron along the North Coast 500 route during our very first time wild camping. We are very much night sky enthusiasts, so another big perk to wild camping is the ability to get away from cities and the light pollution they create. So you know just how much we LOVE photographing the night sky, I will tell you that we planned our entire campervan trip around the phases of the moon in order to see the stars in the dark sky more clearly during a new moon. While wild camping at an overlook along Loch Carron, we went outside to photograph the stars and got much more than we expected. Within minutes, the aurora appeared and moved across the night sky. Just a few minutes later, the clouds rolled in and the northern lights had disappeared. A few nights later we visited an area of Isle of Skye known for their dark skies (Kylerhea), but had no luck as the sky was completely clouded over. We were pretty bummed since the forecast said it would be clear skies. However, we were grateful that we saw the aurora at least one night, and it taught us to never trust a Scottish weatherman! FYI: Kylerhea and Glendale on Isle of Skye are known for their dark skies. 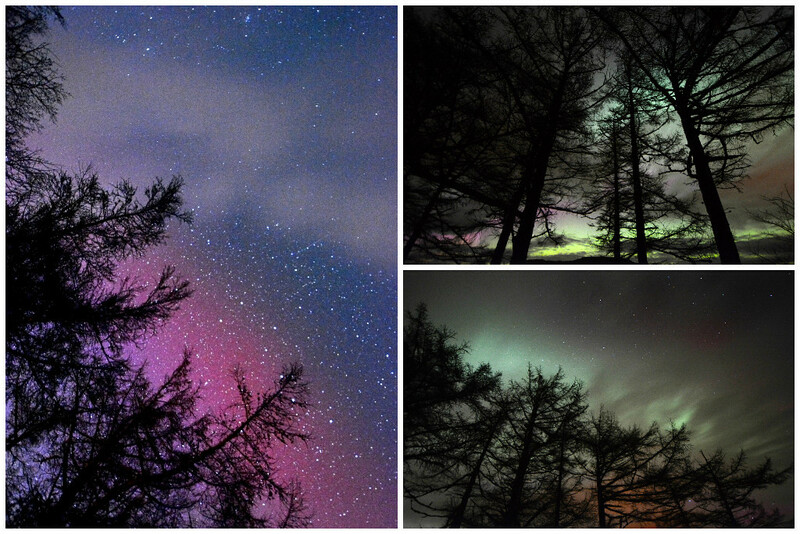 According to VisitScotland.com, other locations around the country where you may have the opportunity to see the Northern Lights (on a clear and cold autumn or winter’s night) include: Shetland, Orkney, and Caithness, Aberdeenshire and the Moray Coast, the Isles of Lewis and Harris, Cairngorms National Park, Galloway Forest Park (Scotland’s only Dark Sky Park), Rannoch Moor and Perthshire, and Angus and the coast of Fife. Even if it isn’t the season for the Northern Lights, these locations should be perfect for star gazing, provided you have clear skies! Our campervan came supplied with two propane gas tanks (you can either pre-purchase propane or fill up along the way.) The gas is used for operating the stove top and oven and works just fine when you’re not plugged into electricity. This means you can still cook meals while wild camping, provided you have enough gas. (Just be sure you’ve turned the gas off before driving.) This gas is also what powers the fridge on the evenings you are not hooked up to electricity at a campsite. There is a knob on the fridge where you can select the power source – electricity, gas, or battery, so you have many options for keeping your food from spoiling while you’re out in the wild! The water heater runs off of the propane gas as fuel, but requires electricity to operate. 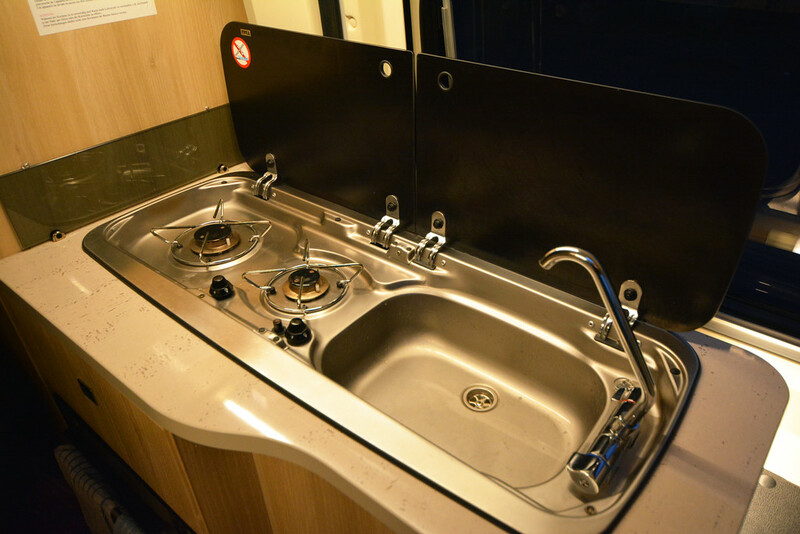 However, the heating and hot water can operate on diesel depending on the vehicle type, so you won’t necessarily be taking cold showers (again, depending on the model type). Truth be told, we never took showers in our campervan, as it was just a tad too small for us. We’re very tall individuals! Though some of Bunk Campers vehicles, like the Grande, come equipped with a completely separate shower. We simply showered on the nights we stayed at campsites and took sponge baths on the nights we wild camped. Isn’t wild camping all about roughing it, even if just a little?! Staying warm was our biggest concern, as our road trip took place during the first two weeks of April, when it was still plenty cold outside! As mentioned, we were able to run the heater using the propane gas and diesel. Our little bedroom in the back stayed nice and toasty during those cool first nights of spring in Scotland. Now, about charging those cell phones and camera batteries. The one thing that won’t work while you’re wild camping is the plug outlets; these only work when you are plugged into electricity at a campsite (not even while you’re driving). Fortunately, the Bunk Campers vehicle we were in came equipped with two USB ports, so we were able to charge our cell phones during the day as we drove. The USB ports still run off of a back-up battery when the vehicle isn’t on, but we never really needed to charge our phones at night. Pretty much the only problem we came across with wild camping was not being able to charge our camera batteries… and we take A LOT of pictures! For that reason alone, I would almost recommend wild camping every other night. 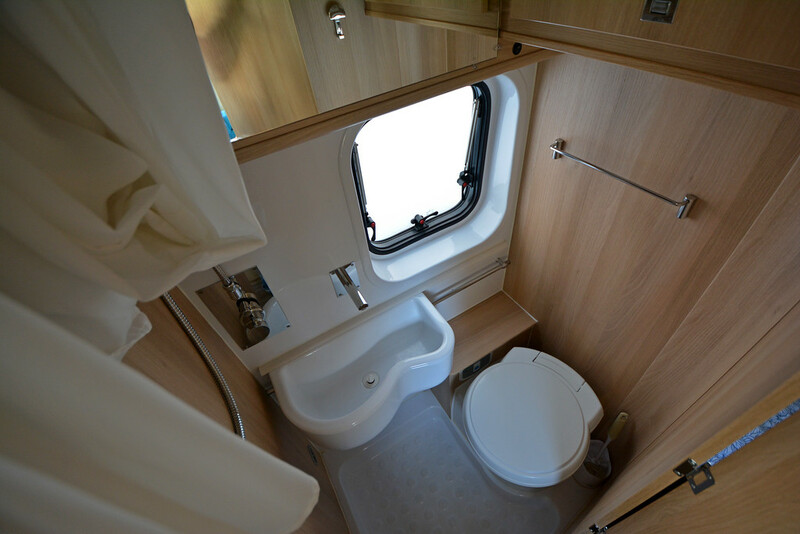 This would also allow you to recharge your batteries, dump your waste water, refill your water tank, empty your chemical toilet, and take a warm shower if your campervan doesn’t come with a shower (or you simply choose not to use the shower in your vehicle, like us). That being said, we were able to fill our water tank outside a local visitor’s center and dump our chemical toilet contents in a public toilet*, so you may be able to get by for more than just one night of wild camping. *It was brought to our attention by a reader that chemical toilets should never be dumped into a public toilet. This individual further explained that the chemicals used in chemical toilets kill bacteria whereas a reticulated sewage system needs the bacteria to break down the sewage. We appreciate this being brought our attention. We’re certainly willing to admit our ignorance and pass along this helpful advice to our readers. So, there you have it! Hopefully we’ve inspired you to do some wild camping on your next visit to Scotland! 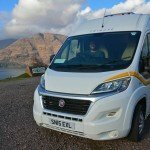 If you’re looking to rent a campervan/motorhome for your next camping adventure, Bunk Campers has pick-up locations in Edinburgh and Glasgow (Scotland), Dublin and Belfast (Ireland), and also in London (England). Now, it’s time for you to go start planning your very own road trip of a lifetime! 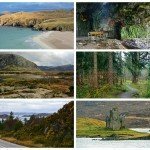 If you’re planning a trip around the North Highlands, please check out our North Coast 500 Destination Guide. 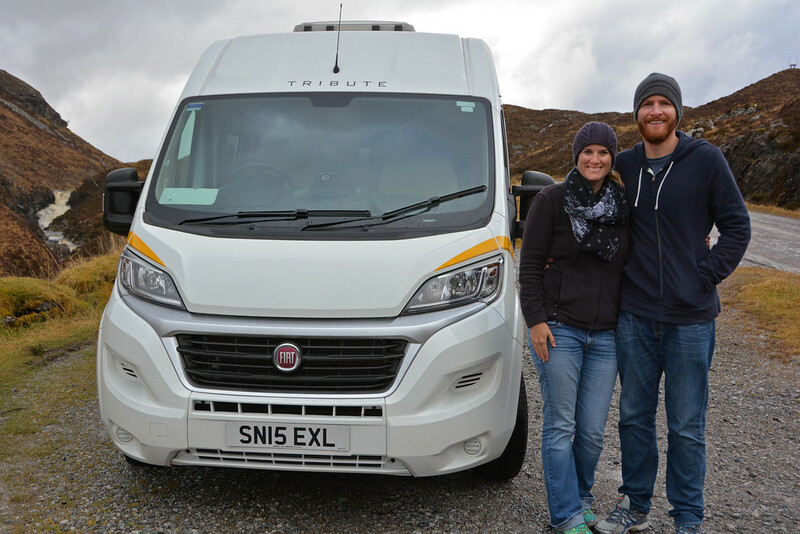 Want to know what else we did on our 12-day campervan adventure through Scotland? Check out the video below! We’d like to thank Bunk Campers for providing us with a discounted campervan rental in exchange for this review. As always, all opinions are our own and are an accurate reflection of the experiences we had. ADDENDUM: As mentioned at the beginning of this post, we’ve received quite a bit of feedback on this particular topic. Some messages were from friendly locals politely educating us on the fact that according to the Scottish Outdoor Public Access Code, wild camping does not pertain to motorized recreational vehicles. Whereas other comments came from perturbed locals who are “fed up with rubbish and human s**t everywhere… and for us to “encourage [campervan wild camping in Scotland] is irresponsible and possibly illegal”. Ok, we’ve heard you loud and clear! We certainly apologize for our misunderstanding and for any misinformation we have provided. The goal of our site is to encourage others to explore and appreciate the beautiful world we live in, not trash it. So if we thought that we were doing a disservice with the information we post, we’d be going against why we started our blog to begin with. While we wish that everyone was a respectful and responsible traveler, the truth is… well, some people are jerks. This doesn’t change the fact that wild camping does NOT include motorized vehicles. So, admittedly the term ‘wild camping’ is used inaccurately throughout this post. That being said, it is not entirely illegal to camp ‘off-grid’ in a motorized vehicle in Scotland. Nonetheless, there are still guidelines to adhere to. We came across this helpful post which does an excellent job explaining the differences between true wild camping (in a tent) vs free camping (in a motorized vehicle). We welcome comments, criticisms, and corrections to what we put our site, especially when done so politely and tastefully. It is certainly not our intention to provide inaccurate information. We appreciate the visitors who respectfully inform us of any falsities and provide us with corrected facts. We did a very similar trip in Iceland and it was one of our best trips! We loved having the flexibility of a campervan. Although, yours looks way more luxurious than ours- it was basically just a mattress in the back of a van! No heat, no toilets, etc!! But it was a blast!! I’d love to do another similar roadtrip and this looks amazing!!! Oh geez, you really were roughing it! We had an SUV in Iceland and it was perfect for getting around! We wouldn’t have wanted to Wild Camp there, as it was March when we visited and a huge snow storm blew through on our last day. At any rate, there are many incredible road trips in Scotland, so I think it’s about time you had another campervan adventure!! We hadn’t heard of wild camping either before we started to research ‘camping in Scotland’ to gear up for our campervan road trip! It’s such a ‘wild and free’ concept and I hope that people continue to respect the area around them when they wild camp, so it can stay legal forever! I’m pretty sure it’s not widely accepted in the US where we’re from, so it was fun to be able to experience wild camping in beautiful Scotland! I love the concept of Wild Camping – living in Aus I see so many signs for ‘no overnight camping that it is refreshing that you can stop anywhere and bed down for the night – and even better you got to see the Northern Lights. Yea, it’s a nice freedom for sure. We love star gazing, so this option is super appealing to us. Seeing the Northern Lights was certainly an amazing addition! How lucky that you got to live in Edinburgh! It’s a beautiful city. And yes, pack up the kiddos and do some wild camping; I bet kids would really enjoy being out in nature! Ok, I’m convinced!! This is definitely something I would love to do. Bookmarking this for when we spend a summer in the UK. We didn’t get to go to Scotland when we were last there. Your photos-especially of the stars looked amazing! So beautiful! Loved this concept of travelling in Scotland. This is definitely something that I would love to try soon in one of my solo travels to Europe. Nice photos by the way! Thanks! You should definitely give it a try; though I personally would be a little scared about being by myself that far away from everything! I’ve never heard of this term but it sounds interesting to say the least. Definitely inexpensive and convenient. I remember doing a big tour of Scotland in most of those places you were visiting and man, it was freezing!! Looks like a fun trip. 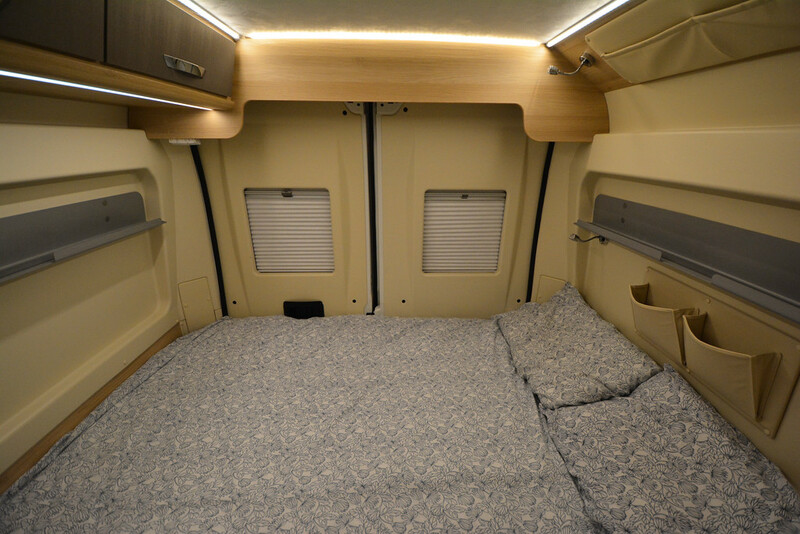 Well, more affordable in a campervan… inexpensive in a tent! 🙂 Either way, it’s a great way to explore the most beautiful, rugged places in Scotland! And yea, it was definitely chilly during our early April visit! The views from the cliffs at Neist Point are gorgeous! What a fantastic spot to stop and wild camp. 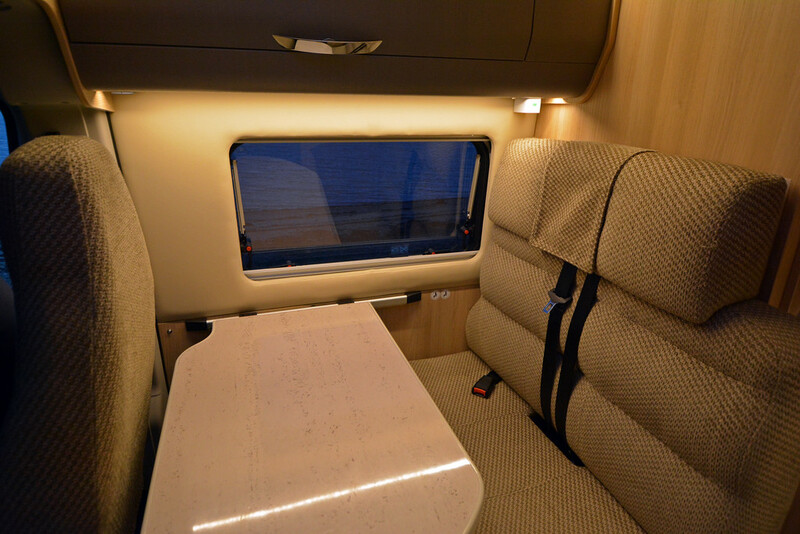 The campervan looks cozy and quite comfortable. I really like the idea of having the freedom to stop and already be in your accommodations. I can hear the silence of solitude as I read. How lucky to have also seen the Northern Lights! Neist Point was our favorite! And yes, having the freedom to stop there and camp overnight was unreal! We did loads of Wild Camping in Australia thanks to the god-send of an app called WikiCamps. There is no other thing screaming FREEDOM more than wild camping – i at least enjoyed it a lot! Your van looks way more comfy than ours – although ours wasn’t bad just a bit cold during our adventure in New Zealand where the inside temperature reached a low of -4C one night…….brrrrr! Cool, good to know about the app WikiCamps. I’m sure we’ll make it down to Australia one of these days! Ahhh, I would’ve been freezing in -4C!! Hopefully you were good and bundled! That looks an awesome trip. I am in Northern Ireland which is only 12 miles from Scotland by its closest points. I don’t think I would get my motorhome down some of those roads though! Another awesome trip would be to do the same thing around the Wild Atlantic Way in Ireland. Just a final thought, can you not get independent USB charges for your camera batteries? I have picked 2 up for our cameras. Great article! My husband and I have already rented our campervan for our three week Scotland adventure September 2017. (I highly suggest anyone looking into renting one do so well in advance as the company from where we booked was about full.) We are vanping (I think it works!) for 11 days and I appreciate all the tips you have outlined here. We are heading out of Inverness up to Orkney, back to Bonar Bridge for the Invercharron Games, over to Skye (we will DEFINITELY check out Neist Point!) and several places in between. We love visiting Scotland but this is our first time vanping (I’m going with it!). Your pictures are amazing! Thanks for sharing and safe travels! Vanping! I love it… it’ll catch on! Yes, booking in advance is key. 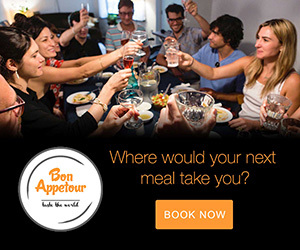 Sounds like you have a great itinerary planned out. 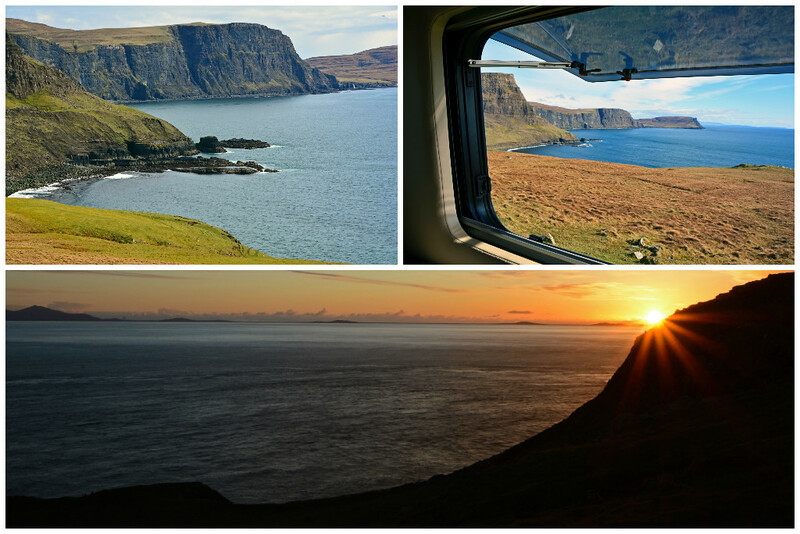 And you simply MUST do some wild camping at Neist Point… one of our favorite memories to date. Who knows… maybe the Northern Lights will be out early and you’ll catch a glimpse! This is likely useful information for people who, like me, thought they could just park wherever they liked! 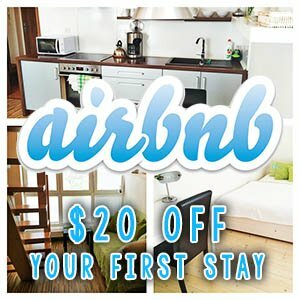 My husband and I are planning a trip in two years and I just LOVE this!! I am wondering how hard was it to drive the camper van on the roads of Scotland as well as find parking places when you weren’t wild camping. We have a self build Huge Sprinter van and often have a small canoe/Bike trailer in tow, we always find somewhere to park overnight and depart in the morning without leaving a trace of our existence ! The great thing for us is, we always arrive late and leave early, so usually we cause no harm and it’s important to make sure we don’t give motorhomers a bad name ! Great practices! Wish everyone would be as respectful, as to not give it a bad name, but not everyone is as conscientious as you. Keep it up! And wow… self-built. How neat! Have a wonderful time. Scotland is a gorgeous country with so much beauty and history to discover!